At Kapakai Kokoiki Heiau in North Kohala, not far from Mo’okini Heiau (which can be seen on the hill in the background), stands this sign. Kamehameha Akāhi ‘Āina Hānau loosely translates as the birthplace of Kamehameha I. He was born here around 1736. The exact date isn’t known, with some accounts placing it as late as 1758. Known as Kamehameha the Great, he was the king who fulfilled Hawaiian prophecies and united the Hawaiian islands for the first time in 1810. He was succeeded by four others in his family who took the name Kamehameha, so the name is in the forefront of Hawaiian history. In present day life it occurs in numerous ways. There’s Kamehameha Day, a state holiday, which celebrates his birth. Kamehameha Schools is an private school system with extensive land holdings on the Big Island and elsewhere. Hotels and other businesses sport the name. A fair number of them will be located on Kamehameha Street, Road, Highway, Avenue, or Boulevard. 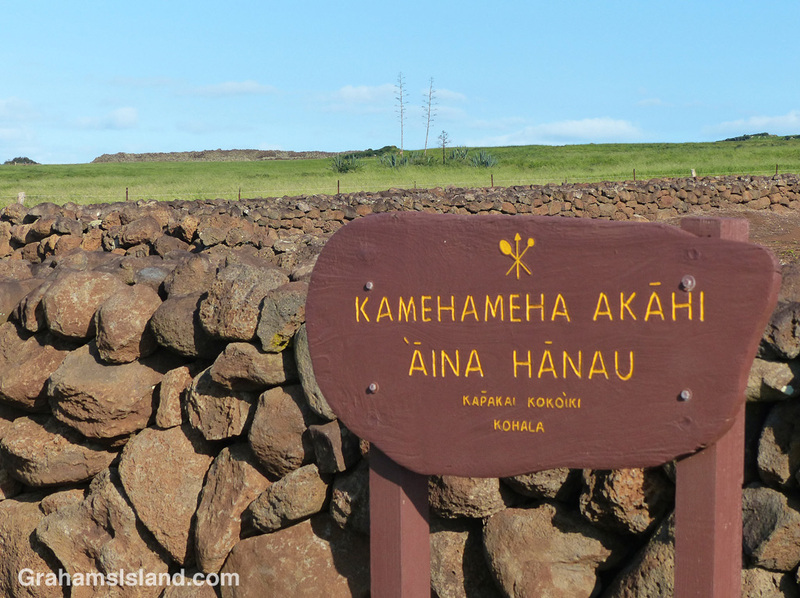 In short, the name Kamehameha is still an integral and important part of everyday Hawaiian life.